Joey Skaggs > Works > 2004 > Bush! President George W. Bush, flanked by his loyal Cabinet and special friends, made a rare public spectacle of himself taking care of business in New York City’s Washington Square Park on July 4, 2004. The President, as part of a large and boisterous Independence Day parade, was seated in a replica of the White House mounted on the back of a tricycle. 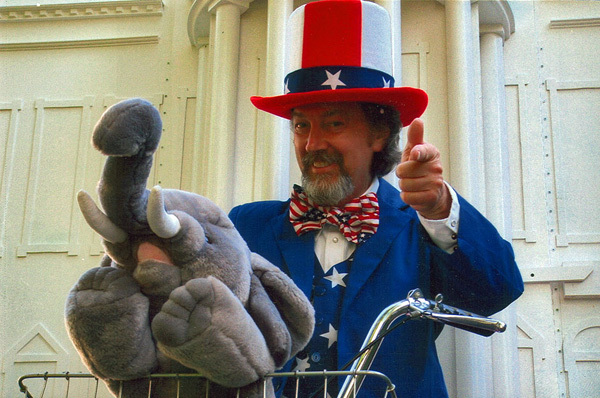 Uncle Sam pedaled it into the park with more than 75 singers, cheerleaders, marching band members, flag bearers and Secret Service operatives. The paraders were caught off guard by jeers and boos from the several hundred on-lookers, but they soldiered on. Spectators were offered an opportunity to line up and greet the President when the parade came to a rest facing the Washington Square Arch by the fountain. The mood of the on-lookers softened and the crowd began to cheer as Bush’s Cabinet members and his friends from the Saudi Royal Family handed out $20.00 bills to purchase their votes. As people approached, Uncle Sam opened the White House door and revealed our esteemed President sitting on his “throne” daintily wiping himself with hundred dollar bills. He was decked out in his favorite cowboy outfit complete with six shooters and a 10 gallon hat. His favorite war toys surrounded him. 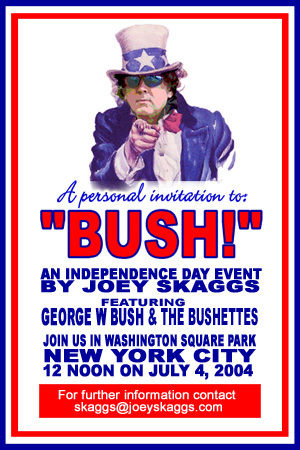 “Bush!”, a colorful and satirical Independence Day performance, was the creation of Joey Skaggs. His troupe of irreverent pranksters–hundreds of law abiding citizens who volunteered their time to work with him–were expressing their outrage over the direction the country had taken under the leadership of President George W. Bush. Joey Skaggs, as Uncle Sam, urged the crowd to express their rights while they still had them, to ensure that our government truly represents the will of the people. He counseled the spectators to hold their leaders accountable or vote them out.